[Maurin Donneaud] has clearly put a lot of work into making a large flexible touch sensitive cloth, providing a clean and intuitive interface, and putting it out there for anyone to integrate into their own project.. This pressure sensing fabric is touted as an electronic musical interface, but if you only think about controlling music, you are limiting yourself. You could teach AI to land a ‘copter more evenly, detect sparring/larping strikes in armor, protect athletes by integrating it into padding, or measure tension points in your golf swing, just to name a few in sixty seconds’ writers brainstorming. This homemade e-textile measures three dimensions, and you can build it yourself with conductive thread, conductive fabric, and piezoresistive fabric. If you were intimidated by the idea before, there is no longer a reason to hold back. The idea is not new and we have seen some neat iterations but this one conjures ideas a mile (kilometer) a minute. Watching the wireframe interface reminds us of black-hole simulations in space-time, but these ones are much more terrestrial and responding in real-time. Most importantly they show consistent results when stacks of coins are placed across the surface. Like most others out there, this is a sandwich where the slices of bread are ordinary fabric and piezoresistive material and the cold cuts are conductive strips arranged in a grid. [Maurin] designed a custom PCB which makes a handy adapter between a Teensy and houses a resistor network to know which grid line is getting pressed. If you don’t need flexible touch surfaces, we can help you there too. This interesting design is part of a solution to a specific requirement, which is to accurately measure hand movements. The photo shows two strips connected together, which pivot as one. The metal disk near the center is a magnet, and underneath it is a Hall effect sensor. When the wrist bends, the magnet is moved nearer or further from the sensor and the unit flexes and pivots smoothly in response. The brief videos embedded below make it clear how the whole thing works. The e-textile construction kit by [Leah Buechley] consists of stitch-able sensors and microcontrollers. Stitch-able refers to the fact that these parts can be sewn with a needle and thread into wearable clothing or other fabric-based housings. 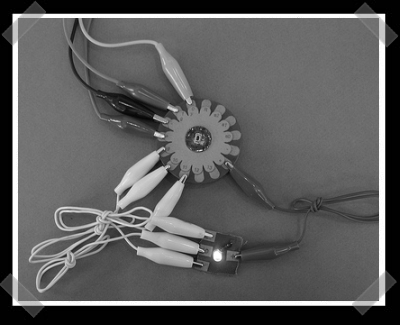 A paper (PDF) on the e-textile construction kit project contains the first version. The second version of the e-textile construction kit, the LilyPad Arduino, is available this month through SparkFun’s site. Especially interesting are her instructions for modifying the clock speed on the Arduino to make it suitable for battery powered wearables. We’ve covered [Leah Buechley]’s work twice in 2005 for her wearable led matrix work. Update: [Leah] updated her site since we posted this and added this new how-to.